Since February 2017 the Applied Research and Communications Fund has been involved in a regional partnership within the Excellence-in-ReSTI project, supported within the framework of the Interreg Danube Transnational Programme and the European Union ERDF Funds. ARC Fund will contribute its expertise to a 12-partner-strong consortium from the Danube Region. In the digital era, creation of social and technological innovation is of paramount importance. The Danube Region does not lag behind the rest of Europe when it comes to ideas and initiatives within the Research, Social and Technological Innovation (ReSTI) field. Still, specific managerial skills necessary for development of ReSTI projects and their implementation are on inadequate level and need to be improved in future. The aim of this project is to remove gaps in knowledge and skills in managing social and technological innovation projects. The general goal is to create an environment in which interested stakeholders can find easy-to-use checklists, learning modules and advice with a specifically tailored content regarding the management of ReSTI projects. The final output of the project is to establish an innovative learning system aimed at increasing employability and quality of ReSTI projects. In order to achieve the main goals of the project, 12 partners from 9 countries created a consortium, led by ZSI from Austria. Project activities are organized in such a way that expertise, experience and contacts of the partners in the ReSTI field play the key role. Each activity set is focused on different strategic aspect and led by the most experienced partner in the field. Project activities encompass building-up networks, identifying gaps and opportunities, developing policy recommendations, creating national and regional roadmaps and strategy, developing guidelines, curricula and learning systems, all aimed at supporting ReSTI projects in the Danube Region. Increasing employability of young graduates as ReSTI project managers. The main outcome is to develop sustainable learning system, i.e. on-line learning modules devoted to spreading excellence in ReSTI management, leadership and administration. Learning modules will provide students with materials and tools in a logical, sequential order necessary for developing certain knowledge and skills (text, files, web links, discussion topics, tests and quizzes, as well as final assessments). The project is primarily oriented towards young ReSTI project managers, as well as administrators in public and private organizations engaged in ReSTI projects, within the Danube Region. Additionally, available know-how within partner institutions regarding ReSTI project management is to be shared with the civil society and small businesses, as well as young graduates as first-time applicants to transnational and multicultural projects. Development of learning modules, roadmaps and strategy, as well as the helpdesk is to benefit the wider community within the Danube region. Hence, project stakeholders include education and training centres, as well as higher education institutions who will benefit from the learning modules. Public authorities, other decision makers and NGOs can find great importance in development of regional roadmaps and strategy in order to successfully direct public policy decisions in this area. Sustainability of the project is guaranteed since the developed learning modules are to be built into existing curricula after the project ends in July 2019. 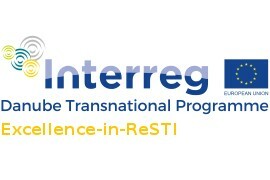 “Excellence in Research, Social and Technological Innovation Project Management” (Excellence-in-ReSTI) is implemented within Interreg Danube Transnational Programme with the financial support of the European Union ERDF and IPA funds.